The moon doesn't get much bigger and brighter than this. On Monday, Earthlings will be treated to a so-called supermoon — the closest full moon of the year. To see the moon at its biggest and brightest, go outside Monday morning just before dawn. Monday's supermoon will be extra super — it will be the closest the moon comes to us in almost 70 years. And it won't happen again for another 18 years. NASA says the closest approach will occur at 6:21 a.m. EST when the moon comes within 221,523 miles (356,508 kilometers). That's from the center of the Earth to the center of the moon. 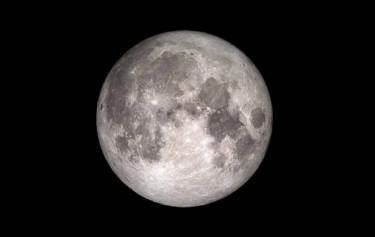 Full moon will occur at 8:52 a.m. EST. NASA planetary geologist Noah Petro is urging everyone to step outside and soak in the view. At the time of closest approach, the moon will be setting and the sun rising, at least on the U.S. East Coast, so prime viewing will be Sunday and Monday nights there. "Ultimately, people should be more geared toward just getting outside and enjoying it," Petro said. Supermoons can appear 14 percent bigger and 30 percent brighter in the night sky. But it takes a real expert to notice the difference. Petro, deputy project scientist for the Lunar Reconnaissance Orbiter circling the moon, said Thursday that even he won't be able to see much difference in size and luminosity. What counts, he said, is getting people "talking, thinking and caring about the moon." Weather permitting, it's a sky show the entire planet can enjoy. "Everyone gets to see the moon," Petro said. "It's a great shared resource for all humanity." The last time the moon was so close — actually, 29 miles closer — was in January 1948. That's the same year the Cleveland Indians last won the World Series, Petro noted, "a big year," at least there. In 2034, the moon will come even closer, within 221,485 miles. That, too, will be a supermoon.